So, to carry on with the story. Over 4 months ago, I completely quit sugar. No more chocolate, no more cookies, no more yummy desserts. In this video, I show you how to stop habitually putting that sweet stuff into your mouth whenever you feel a craving or desire for it. Basically, you want to observe the sensations of wanting a yummy sweet treat with as much acceptance, curiosity, and non-reactivity as possible. Don’t act on them or try to change them in any. How will that help, you ask? Won’t that just make you want the stuff even more? 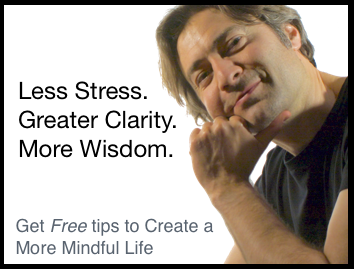 In part 3, I’ll show you a little (actually, a very big) secret that will help you a lot when doing this kind of non-reactive, mindful observation. Once you realize this secret, it will allow you handle even the most uncomfortable, icky, or compelling sensations and thoughts, without needing to act on them or repress them. 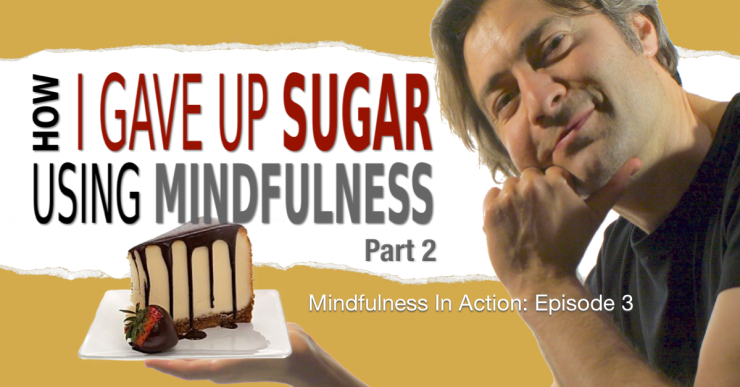 I’ll also summarize what you’ve learned in this series and show you how to put it all together to help you use mindfulness to stop eating sugar. If you know someone who’s been struggling to give up sugar, or struggling with food cravings in general, then this series of posts could be very helpful to them. Feel free to send them an email with the link to this post and pass it along. Now we’re going to get into the nitty gritty of applying mindfulness to sugar cravings. By this point, you know how to identify the physical sensations and mental activity that arise when you get a hankering for some sweet stuff, and you’re familiar enough with these sensations that you can easily identify them when they arise. If that’s not the case, then you should watch part one of this series, follow the instructions and then come back and watch this one. When you notice these sensations arise, your task is to observe them, without reacting. Accept and be curious about the physical sensations, thoughts, and so on that arise. And do not act on them or try to change them in any way. That’s the trick. I won’t lie, this is the hard part. Well, as much as I’d like to be able to wave a magic wand and make all those uncomfortable sensations and thoughts go away, you and I both know that isn’t going to happen. These physical sensations of craving sugar, the thoughts, mental images and stories that weave through your mind, enticing, justifying, commanding, all of these things arise in the mind as a natural process because of prior causes and conditions. In other words, your past thoughts and actions are what create your present moment experience. And I don’t mean this in any sort of far-out woo-woo kind of way. It’s actually really easy to see. If you don’t believe me, pull up a picture of your favourite dessert, the one you find impossible to resist, and stare at that picture for several seconds. Notice any increase in desire for sweets? If you repeat this action several times a day, I’m willing to bet that you’ll probably end up eating something with sugar in it that day. You’re training the mind to eat something sweet when you see a picture of a delicious dessert. Do this often enough, and it basically becomes habitual. You’ve conditioned yourself. Now, what I’m asking you to do is exactly the opposite. When you experience craving for something with sugar in it, take no action. Do this often enough, and you will wear away at that old conditioning. After a while, that picture of your favourite dessert will result in nothing more than a little blip on your mental radar screen. “Oh, there’s that dessert again,” and that’s it. Craving gone. But it might be pretty tough going the first few times. If you’re deeply conditioned to use sugar to fulfill various needs in your life, as most of us are, it’s going to be difficult to go against that and just observe non-reactively. But there’s a little secret that, once you realize it, can help you a lot. And this secret can make it relatively easy to stay present with even the most painful or uncomfortable sensations, thoughts and so on. I’ll share that secret with you in part three, where I’ll wrap this series up and help you put it all together. So, go ahead and start observing the physical sensations, thoughts and so on, that tell you that you want to eat something with sugar in it. And do it in a curious, accepting and non-reactive way. Don’t do anything to get rid of these sensations or try to change them in any way. Then join me next time for part 3.